Graves Motorsports Yamaha R1 / FZ10 / MT10 Cat Eliminator Y Pipe Upgrade with (Exhaust Valve Type-R – Butterfly Valve Technology). Requires FTEcu software purchased separately to use the EVR activation map code included with the sale of the Y pipe. This Y Pipe fits Graves Version 3 Cat eliminator systems on the R1 and FZ10 that have our standard link pipe cat eliminator. (Connects as upgrade to Graves V3 cat eliminators only, this will not inter connect with other systems or stock sized silencers). 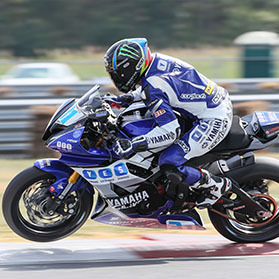 This exhaust system was developed using the same technology that has powered Monster Energy Graves Yamaha riders to 7 straight consecutive Moto America / AMA Superbike championships along with numerous 600cc titles. This product is intended for closed course competition use only. Use of this product for any other purpose is strictly prohibited. Scroll down for installation videos. The Graves EVR uses the factory exhaust motor and cables and custom mapping to improve torque and drivability at low to mid-range rpm and small throttle openings to create a more liner power curve and improved ride. This is particularly effective on exhaust systems with shorter silencers that can rob your bike of small throttle responsiveness while reducing the sound to acceptable levels. We did not allow compromise in the development of this system. Material diameters and lengths are optimized for maximum power output throughout the throttle and RPM range. "The EVR or Exhaust Valve Type R is and electronically controlled valve that improves drivability at small throttle and low RPM ranges where it matters most to the rider. The systems can also be utilized to reduce sound by a significant amount without reducing maximum power output." 200mm Length Silencer Design (Titanium) designed to match the R1's "Superbike Inspired" Race lines. 1 Auto Tuner Style Lambda sensor receiver comes standard (OEM dual sensor mounts up front are eliminated for a smoother flowing exhaust). When using any Graves performance system on the 15-17 R1 Flash Tune products are recommended to enhance the bikes performance everywhere. The most effective tune on this setup does not utilize the stock lambdas at all).